We are celebrating 40 years of Seiwa-en, the Japanese Garden. Since 1977, this beautiful and authentic space has welcomed millions of visitors. From the spring cherry blossoms to the late summer sacred lotus to the winter snowscapes, each season highlights a different feature of the garden of "pure, clear harmony and peace." You likely have your own special memories of the Japanese Garden. 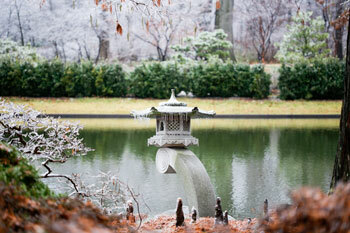 Please make a special gift today to honor the beauty of the Japanese Garden and celebrate its 40th anniversary. Consider making a recurring gift of $40 per month to honor this special anniversary and beloved garden. Thank you for making a fully tax-deductible contribution to the Missouri Botanical Garden. With your support, we can continue to create beautiful spaces for visitors to celebrate nature for years to come. Please note, this gift is not an annual membership. If you'd like to make a membership donation, click here.